Matt Hackett (goalie) made his first start for the Gulls, and starter John Gibson was given a rest from the road trip fatigue. Hackett recorded 18 saves on just 21 shots. The Gulls recorded more shots (24), but Bakersfield goalie Laurent Brossoit was having none of it, recording the shutout. 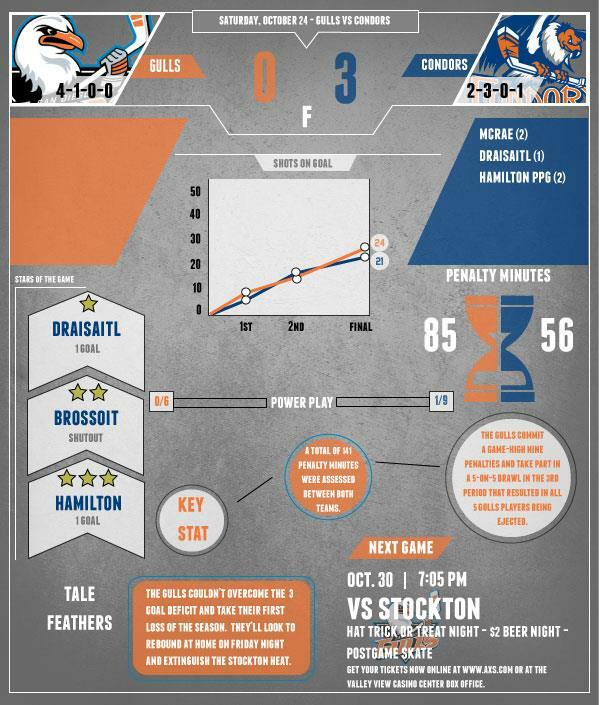 Fatigue played a huge role in fueling the rival matchup, as the Gulls had a long bus ride from San Jose to Bakersfield the night before, not arriving at accommodations until 1:30 am. Penalties: A whole lotta misconduct! 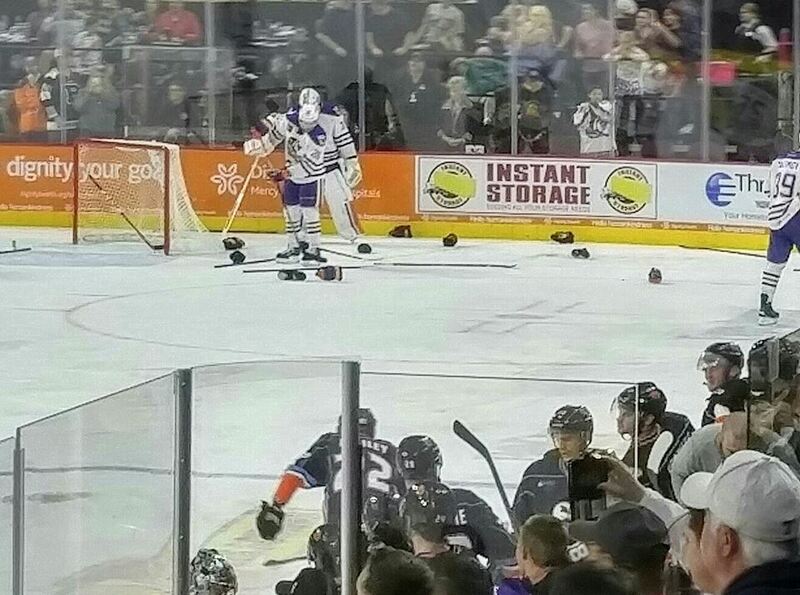 Bakersfield had 9 power play chances (only capitalized on one, so kill unit is still strong), 85 total penalty minutes allowed for Condors, 141 total penalty minutes. With all of this, only 45 shots for the two teams combined. Here is a list of all penalties, take note that at one point in the 3rd, the hockey match appeared more like wrestlemania, with all 10 skaters sent to the box at once. The game was hectic. Referee had a heavy whistle in his pocket for the Gulls early. Official: 4787 in attendance at Rabobank Arena, though several fans attending game estimated no more than 2,500. 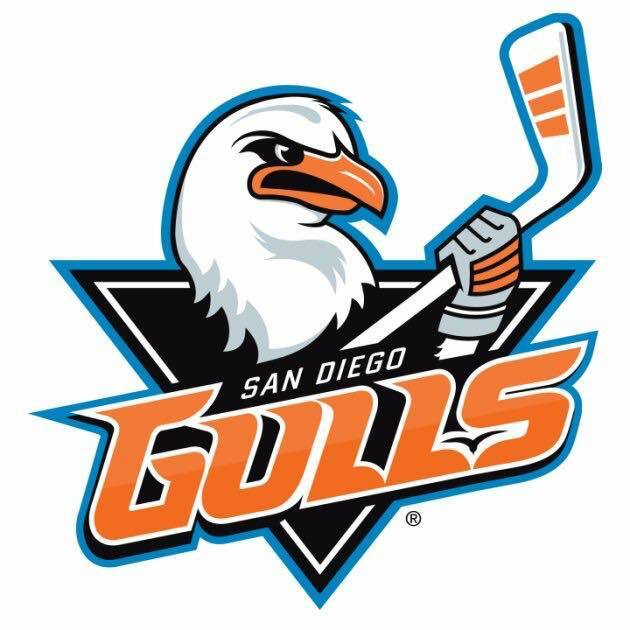 Gulls back on ice Friday night (October 30th @ 7:05 pm) at home for our first matchup with Stockton (2-2-0-0. Kids costume contest and trick or treating on the concourse, first post game free skate, and of course, 2$ beer night! Should be a great matchup and good fun! All games can be viewed at Rockin’ Baja Lobster, seen via an AHL Live Subscription, heard on Mighty 1090/ESPN 1700, or followed on the San Diego Gulls Twitter page. Home game tickets available at AXS.com. Be sure to come out Friday, teams will both be equally rested after losses!